It looks the part of a proper English pub but the ale quality (Whitstable IPA) lets it down. Mainly populated by tourists who opt for Guinness or lager and who can blame them with the second rate ale served. Nice corner pub, Shepherd Neame away from their heartland, and the upstairs is lovely with a bow window like a captain's cabin with theatre posters all around it. Range of Shep beers included Early Bird for on that day I was one. Easy-going and relaxed atmosphere, efficient service and well-kept Shepherd Neame ales. The pub serves food, but I was on a purely drink visit. Well worth a look in. 7/10. 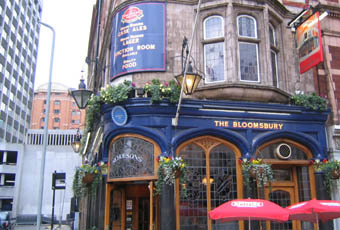 As the Bloomsbury is the first London pub I ever visited (way back in 1992), it maintains a place in my heart that's probably not commensurate with its actual qualities. Certainly, it's one of the prettiest pubs in London especially in summer when all of the exterior plantings are in bloom (heh - bloom' - get it?) The interior is not quite so lovely - smallish and garishly lit up at one end by a trivia game or a fruit machine or some such thing. In the past, I've had excellent Brakspear's Bitter (and had two employees argue over how to pronounce it) but in recent years, Spitfire, Bishop's Finger and Master Brew have been featured prominently. Do they serve food? I have no idea. Close to the British Museum and some of the theatres, it's worth a visit particularly after a show lets out and the place is relatively uncrowded. I'll continue to drop in for sentimental reasons though there are probably better places nearby. OK pint of Spitfire. I liked the laid back atmosphere and the fact they had a couple of daily newspapers on the bar to read. A very typical London Pub.